SASKATOON — It was a summer for love in the NDP caucus. While leader Thomas Mulcair was busy criss-crossing the country this summer meeting Canadians, four of his new MPs tied the knot. Quebec MPs Lysane Blanchette-Lamothe, Pierre-Luc Dusseault and Anne Minh-Thu Quach and Ontario's Dan Harris all said "I do." Quebec MP Jonathan Tremblay also got hitched in the spring. 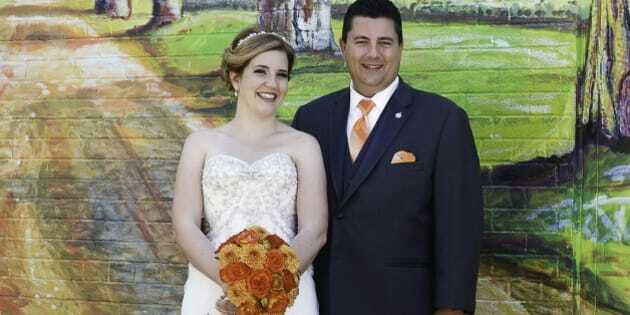 Blanchette-Lamothe, 29, was married on July 3 in Colombia, where her husband, Ronald, is from. The two met at l’Université du Québec à Trois-Rivières when they were both students. Because of her busy schedule, Blanchette-Lamothe said she was the last person in her wedding party to leave Canada for the marriage ceremony in Colombia. "On July 1st, after my last Canada Day event (10:30 p.m.), I went to the airport. I had to catch the only plane that still could bring me to Colombia on time to my wedding. It was tight, but I made it!" she wrote HuffPost in an email. She arrived 12 hours before her wedding. About the same time, her fiancé's luggage, which had been lost for days by the airline, also arrived. "The rings were in that bag, so we were really very happy to retrieve it!," she wrote. The ceremony and reception were followed by a 10-day trip filled with enchanting beaches, rafting, canyon hiking and museum visits where their two families got to know each other, she wrote. "It was the first time our parents met," she wrote. Twenty-two-year-old Dusseault, the youngest MP ever elected to the House of Commons, married his girlfriend, Joanie Boulet, on July 27 after more than five years together. Boulet has been a regular fixture on Parliament Hill, coming up to lunch with her beau when she had free time from l'Université de Sherbrooke. The reception was in Sherbrooke with 200 guests, including several MPs, Dusseault said. Minh-Thu Quach, 31, married her first love, Mathieu Dubé on June 29. She was 13 when they met; he was her brother's best friend. Theirs was a civil ceremony presided over by her brother, Huu-Nghi, during an evening reception with 200 family members and friends at a local community hall in Coteau-du-Lac. Min-Thu Quach said a traditional Vietnamese ceremony also took place at her parent's home in Salaberry-de-Valleyfield. "It was a wonderful day where we took photos in the national park and danced a lot!" she told HuffPost. Jonathan Tremblay, 28, married his longtime girlfriend Rebecca on April 26. They have been together since 2003 and have three boys, Nathan, 7, Jacob, 5, and Caleb, 20 months. After 10 years, Tremblay said they decided to tie the knot. "It was a suprise wedding," he told HuffPost. "We invited people to come celebrate our tenth year anniversary, but when they arrived we informed them they were actually there to attend our wedding." Harris, 34, married longtime girlfriend Melissa McCormick, a social worker at Toronto's Centre for Addiction and Mental Health, on Aug. 24. They wed at the Scarboro Golf & Country Club and had an Algonquin Park-themed wedding. Harris and his groomsmen entered the wedding ceremony wearing moose, wolf and black bear hats. They mixed kissing games with animal impersonations and had their guests answer trivia questions about the park. The Ontario provincial park was the site of one of the couple's first dates, in 2007. Harris said he proposed there last summer, during an 11-kilometre hike, in front of a bull moose, a turtle and a humming bird. After their nuptials, the two left for a week-long honeymoon that included a train ride through the Rockies and an Alaskan cruise. Harris told HuffPost he thinks it has been a busy summer for weddings in the NDP because members of the caucus are just so much younger than the other political parties' and the timing — halfway between the last election and the next — was optimal. "When you look at this caucus compared to other caucuses, there are lot more people at that age and time in their lives," he said. "We have 22 MPs under the age of 35, so a lot of them are probably feeling a little bit more settled, they are past getting elected and getting settled into the job, so I think this summer was probably a good one to do that because we are a couple of years away from the next election, so there is enough distance so it is not going to impinge on anything else that we do," he said.